An often-asked question on the Travelfish.org Vietnam forum is, “Should I book my flights in advance or when I get to Vietnam?” The answer depends on a number of factors, most notably when and where you want to fly, how flexible your flight times are and what your budget is. So it’s not an easy question to answer generally, but here’s some information that might help. With four airlines operating internal flights in Vietnam, and all providing an online booking service, there’s plenty of choice and booking in advance is easy. Also, most of the flights booked online can be amended, should your plans change – at a price of course, but at least you’ll not be stuck with a flight you can’t use. Do check booking conditions of the individual airline and flight type before booking though. If you’re happy to wait until you get to Vietnam you might be able to get a better price; one trusty travel agent told me that she could book flights cheaper than online with the standard (national) airlines but not with budget providers such as Jetstar. As long as you have some flexibility, waiting until you arrive shouldn’t leave you stranded – except for at peak periods when booking in advance is definitely recommended – as there are usually flights available for the same day or next. Here’s a quick rundown of the four airlines operating domestic flights. Vietnam Airlines (a Skyteam alliance member) is the best of the lot, in terms of routes, airline quality and timeliness, but is generally more expensive. Its prices are tiered from Super Saver – the cheapest – up to Business Flex. Super Saver fares aren’t often available – it says “sold out” but I think it’s more a case of them only being available at certain times – so the best fare is usually the Saver. Note though that the fares, even within one tier, vary at different times of day and the year so flexibility, and the willingness to fly during the very early hours of the morning, could you save you some dong. 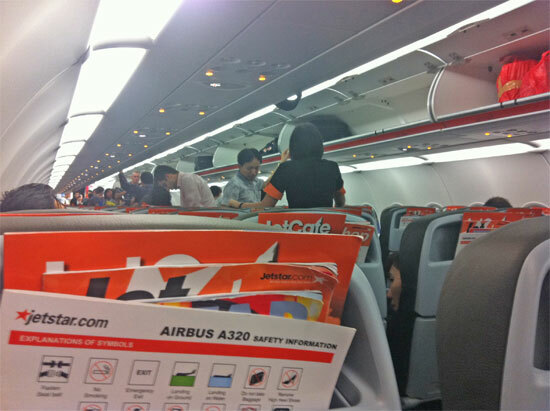 Jetstar is an established budget operator in Vietnam now and is usually cheaper than Vietnam Airlines, but you get what you pay for in terms of service and timeliness. If you’re not in a rush and have a mobile – they will text with details of significant delays – its regularly delayed flights might not bother you so much, but a five-hour wait at the airport isn’t going to impress anyone. If you tick the “I just want the cheapest flight” option the site will generate a neat graph showing the cheapest fare each day for a 30-day period around your preferred date, from there you can select the time of flight and add on extras, such as flexibility and luggage. Watch out for the other charges such as paying by credit card. Air Mekong and VietJet are newer additions. Air Mekong is worth a look if you’re flying to Phu Quoc, Qui Nhon, Pleiku, Con Dao or Dalat as neither Jetstar nor VietJet fly there. As with Vietnam Airlines, its flight prices are divided into five categories, with some rather complex fare conditions — be sure to check before booking. VietJet is very new and from Hanoi only flies to HCMC. In the “Booking Engine” box you have the option of two buttons: “Find Flights” and “Find Value Fares”. Wondering what the difference is? Mystery solved: “Find Flights” shows flights and fares just for the dates you have requested; “Find Value Fares” shows a calendar for the month and the cheapest flight each day, neatly colour coded. What’s the real difference in prices between the airlines? I can’t offer a conclusive answer as it depends when you’re travelling and when you book, but to give an indication, I looked at prices for a month’s time and three months’ time, avoiding weekends, one-way between Hanoi and HCMC, which is the only route they all operate. VietJet was slightly cheaper than Jetstar, at just under 1 million VND including taxes and VAT, with neither including a checked baggage allowance: for Jetstar that’s 100,000VND (US$5) but VietJet doesn’t tell you what it is until you’re into the booking process. Surprisingly, Vietnam Airlines was cheaper than Air Mekong: a Super Saver was available for the end of February but not at the end of April when a Saver was the best option at 1.7 million. Both include checked luggage. So from the cheapest to the most expensive there’s about a 900,000 VND difference — it’s worth shopping around if budget’s a concern. In conclusion, if you’re booking online there is a definite benefit to booking in advance as you will be more likely to bag a deal. If you need to keep your options open then booking on arrival through an agent or at Vietnam Airlines’ office could save you money — and online booking is there as a backup.